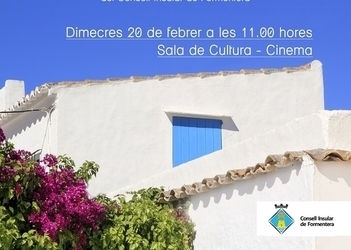 The Formentera Council's office of tourism reports that on Wednesday February 20 at 11.00am the Sala de Cultura will be the scene of a gathering to inform islanders about the effort to regulate for-profit holiday rentals. Tourism and land councillor Alejandra Ferrer and David Francés, the administration's legal counsel on land-use for tourism, will lead an overview of recent changes to the local system of regulation. The gathering will be an occasion for islanders to learn about the so-called “Plan for Quality in Vacation Rentals” which involves setting guidelines for single- and multi-family homes. Twenty-six of the preconditions are non-negotiable; other criteria, of which there are 20, would be applied distinctly, and only 14 would be required for a dwelling to be eligible for rental. Discussion will also focus on changes to the tax bylaw underpinning a levy for administrative services in tourism as well as the bylaw regulating the per-bed cost of permits to rent out accommodation. The effort to regulate holiday rentals, part of a recent Govern-backed tweak of tourism legislation, will also be addressed. Application deadlines will be communicated as well so that islanders can start preparing required documentation. Other points of discussion: the zoning plan for tourism that followed final approval of Formentera's land-use strategy (PTI) and the new cap on holiday rentals. Islanders will also be given the opportunity to ask questions or voice concerns. The gathering is open to anyone interested in finding out more about the changes.